Each output frame is the average of multiple input frames: from the current frame, back to a given number of previous frames. This is similar to the Trails effect, except all frames within the range are weighted equally instead of fading out, so the end points of the trails are abrupt. Each frame contributes only 1/n of the total brightness, so fast-moving objects against a dark background may seem dim. The average is reinitialized whenever any non-consecutive frame is processed: either the first frame, reprocessing a given frame, or jumping to another frame. You must process multiple frames of a clip in a row to observe the effect. Ave Over Frames: Integer, Default: 10, Range: 1 or greater. 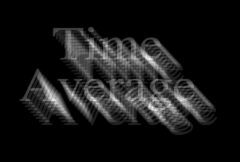 The number of previous frames to average over, including the current frame. For correct results, this parameter should not be animated.